Our kitchen now, after refinishing the floors! Long story short, Colette and I discussed and researched every possible solution from the simplest DIY options to complete professional floor replacement. There's almost too much information available online on this topic, and at the end of the day it can easily all leave you flat-out confused and unsure about what will and won't work in your situation. Should you do a complete sanding down to bare wood, and re-stain and re-finish? Will chemical etching and refinishing work? Will buffing/screening and refinishing do the trick? 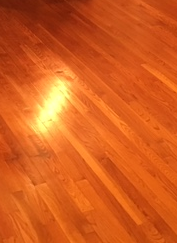 Or are your floors too bad for all of those and you need to either live with them as-is or completely replace them? And how do you know? The biggest obstacle was trying to pick a solution that would make a notable impact for dog-scratched (and just plain old/worn) floors. Most of what we read made it seem like complete sanding or replacing were the only viable options. But at long last we decided to give screening and refinishing a try and we are very happy with the results! 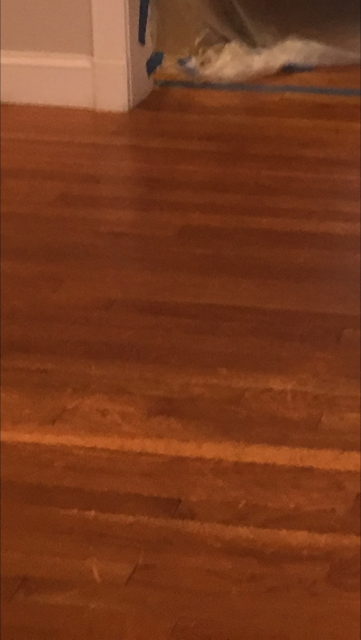 The idea is to sand off as much of the polyurethane finish as needed to make a notable improvement in the consistency and texture of the floor. 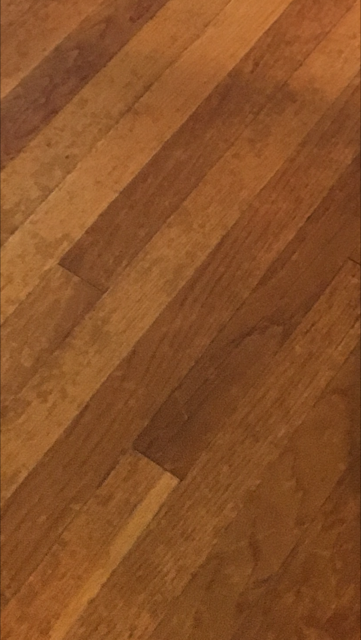 This technique will remove most surface/superficial scratches (not down to or into the wood) and many other imperfections that don't go too deep. Screening won't do anything for dents in the wood or scratches that penetrate past the finish into the wood. So in other words, if you're looking to make a 40 year old floor look brand new, you probably need to just replace the floor - or at a minimum do a ginormous super sanding project that likely will leave you wishing you had replaced the floor. So onto our project. We started with the kitchen floors. First we removed all the furniture and then covered everything with sheet plastic (large box from Home Depot). Then we did a thorough vacuum and mop of the floor. Next I rented a floor buffer at Home Depot and went to town. Warning up front: a floor buffer is a hard machine to operate - but after a little trial and error and learning to control the machine by brute force it's pretty easy to use. Took me about 20 minutes and a couple YouTube videos to figure out how to keep the machine from racing all by itself across the floor every time I turned it on. I went through 4 100-grit sanding disks on this floor. Probably could have gone through 6, but after a couple hours of sanding the whole floor (and sanding the really bad spots again and again and again and again) Colette and I looked at the floor and decided enough was enough. (Note: we also used a pole sander and 100 grit screens to sand the edges all the way around the room). Next step was to do tear down all the plastic. Then came a thorough vacuum of the floor, after which we mopped it and vacuumed some more and then mopped and vacuumed some more. There was a decent amount of dust, but it wasn't horrible and was nothing like what we would have had if we'd done a complete sanding of the floor. After the floor was completely clean and dry it was time to put on the polyurethane. (Note at this point we could already tell the floors were in a lot better condition.) We used Varathane quick dry polyurethane in semi-gloss. 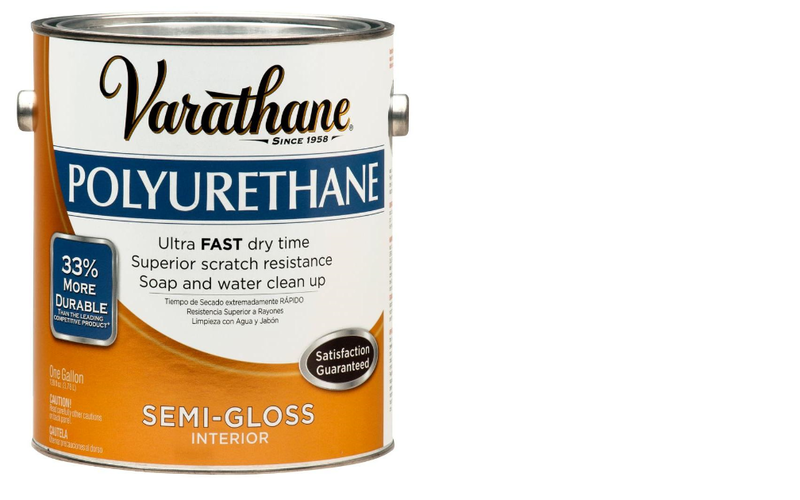 We chose Varathane mainly because we've used their products before and found them easy to apply and quick-drying which is a huge plus. And Colette, being the truly beautiful artist she is, as well as our undisputed resident expert on all things color/aesthetic, quickly determined that full gloss would leave a super pretty shine but would also magnify every imperfection (the last thing we needed), so we decided that semi-gloss was the way to go. It took 3 coats of the polyurethane to do the job. The 2nd coat goes down a couple hours after the first, then you wait a day and apply the third coat. To apply I used a special synthetic mop head designed for water based finishes from Home Depot which attaches to a painter's pole. You basically start in the farthest closed-in corner of the room and "paint" your way section by section all the way into the opposite corner until the whole room is coated. It takes a little practice to get the hang of the mop and polyurethane to make sure you're applying it evenly and not blotchily, but once you get the hang of it it goes quickly. Make sure you don't apply too thick of coats though (we learned that lesson the hard way here). So after about 2 days worth of work, here is our new kitchen floor which we couldn't be happier with! My beautiful wife Colette is so remarkable in so many ways. I am a blessed and infinitely thankful man! Colette invests so much of her time and herself every day into taking care of our large, busy family and keeping everything organized and running efficiently. She amazes me with the truly remarkable job she does, and how she does all she does with such excellence! But last night it was it was time for the tables to turn as I cooked dinner for Colette while she spent the evening relaxing and enjoying a very well deserved break! When I venture too far outside my culinary comfort zone of pizza and grilling, things can get a bit risky. But to accompany the main course of steak tips, I took on the extreme challenge of making a side dish of cauliflower gratin with goat cheese topping and a flourless chocolate cake for dessert. If I'm being honest, I would have preferred just grilling the cauliflower and cake, but all in all I think everything turned out OK, so I thought I'd share here for anyone else who may want to take a similar stab! First, I baked the cake. Thankfully I got some expert help from my extremely capable sugar-toothed assistant, Miss Chloë! We worked together and made the following cake. 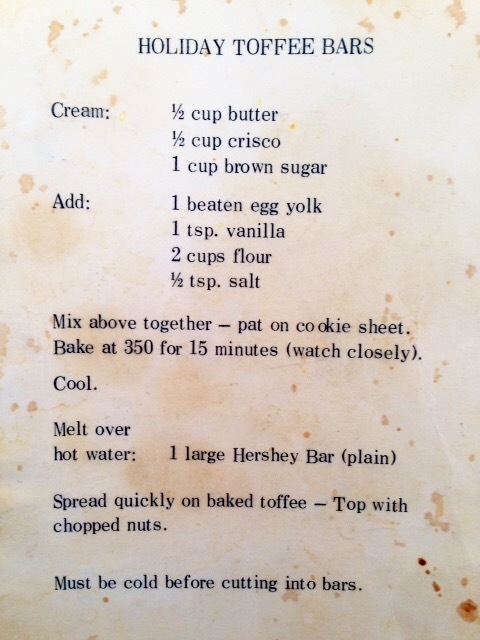 Basically just followed this recipe as written. It's pretty straightforward. The only notes I'd add is that we didn't bother with the parchment paper, and also the cake took 5-10 minutes longer than listed to cook for some reason. Otherwise, things went pretty smoothly. We made the cake, let it cool a bit in the pans then let it cool some more out of the pans on a wire rack. Then we made the whipped topping frosting with this recipe. We let the frosting chill in the fridge for about 30 minutes, and then I let Chloë work her magic frosting the cake! A warning note about cauliflower in general. It's like scallops--tastes great, but smells absolutely horrible while cooking. So don't be alarmed. Couple other notes on this recipe. I used fresh thyme and just chopped it on a cutting board. Also, I used a blender instead of a "food processor." Once again, I found that this dish took a little longer than listed to cook (i.e., to get lightly browned on top). And finally, we skipped the bread crumbs. Mix in bowl and then rub steak with lemon juice and rub dry rub on both sides and let it marinate for at least 5 hours. I applied the rub to both sides of the steak tips and left in a pan to marinate overnight (about 24 hours total). I put the steak tips on the grill and then after about 5 minutes or so I put the cauliflower into the oven. In hindsight, I could have started the steak tips and caulifower at the same time and the timing would have been perfect. But the timing still worked out pretty good and I think all in all things turned out pretty good. Doubled the recipe to fit on a 9x13 or larger pan & first lined it with parchment for easy cutting & clean up. We love food. Our whole family does. 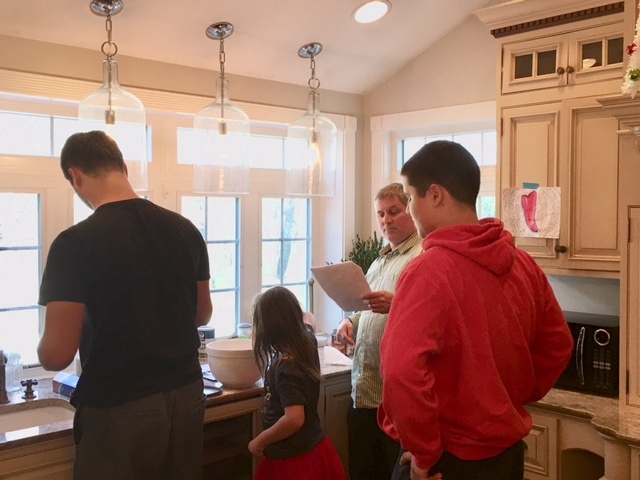 Enjoying food together is a regular highlight of many of our family activities, whether it's going out to eat somewhere cool or at home enjoying one of the many scrumptiously savory food delights Colette blesses our family with day in and day out. My culinary responsibilities in the family consist mainly of eating and doing dishes, but I do pitch in with the cooking from time to time in a few specific areas: grilling meats, smoking meats, and making pizza (all of which take place on the back deck, so I guess that makes the deck my own personal backyard kitchen) and with Christmas around the corner, I am feeling especially festive & festive = pizza in our house! Pizza is the food topic today. I love to cook for Colette, so she can kick her legs up and be served for a change. I like to be able to give Colette a much-needed break from the kitchen, and to make her something she really enjoys. Thankfully pizza is one of those things! I experimented with something new yesterday -- pizza with a gluten-free pizza dough, baked in the outdoor pizza oven. It turned out great! I used to make pizza indoors in the oven, but no more! 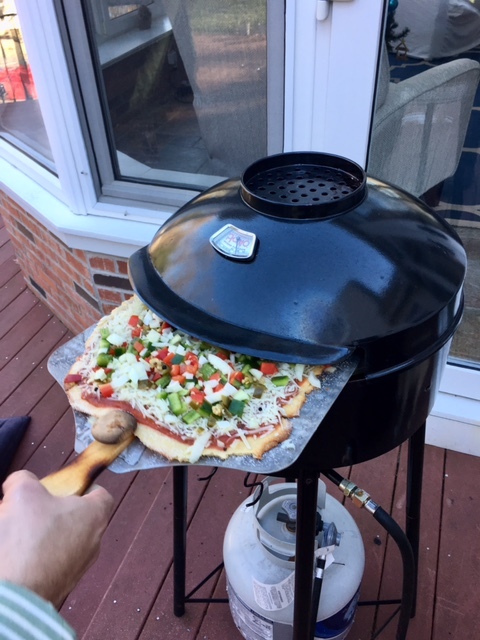 Ever since Colette gave me this Pizzeria Pronto outdoor pizza oven as a gift, I can hardly bring myself to cook pizza the "traditional" way anymore. This awesome pizza oven cooks on a stone at a very high temperature just like a wood fired pizza grill, and the results are off the chart amazing -- especially if you like neapolitan style pizza crust. 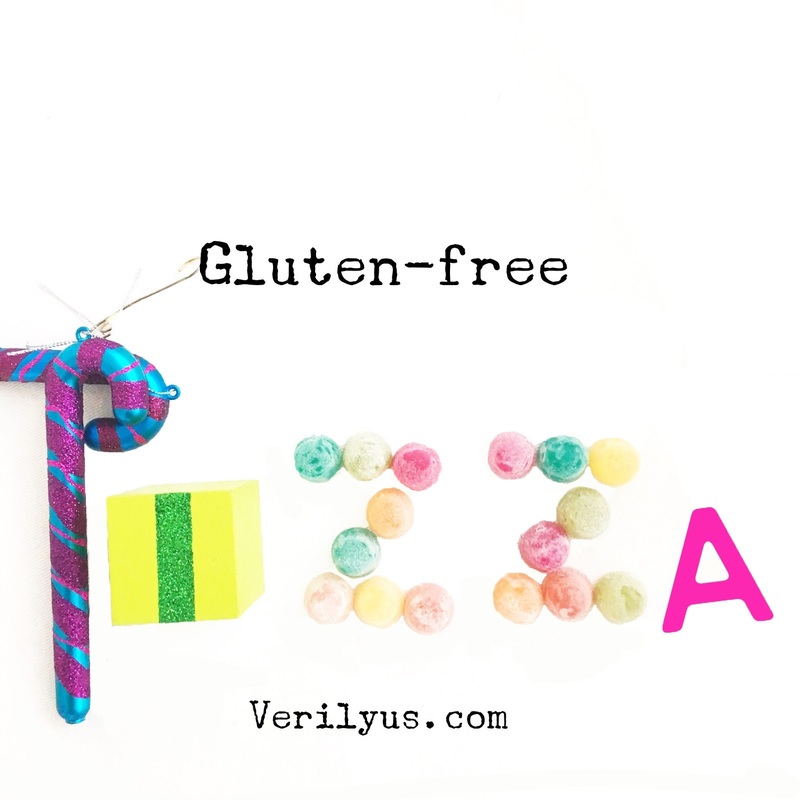 So back to the gluten free pizza. 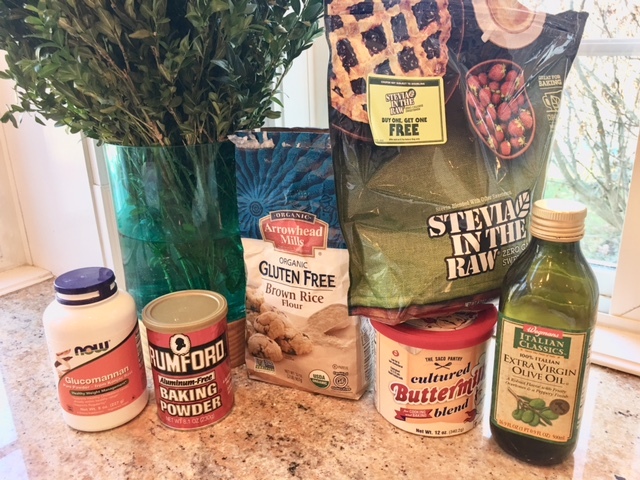 For the most part I followed this recipe from King Arthur Flour as described, but I made a few slight departures from the exact ingredients and steps listed. I'll walk through the whole thing here. First I made the dough. I measured and mixed all the dry ingredients in a bowl, then added the wet ingredients and mixed by hand. With reckless abandon, I completely disregarded the dire warning in the K.A. 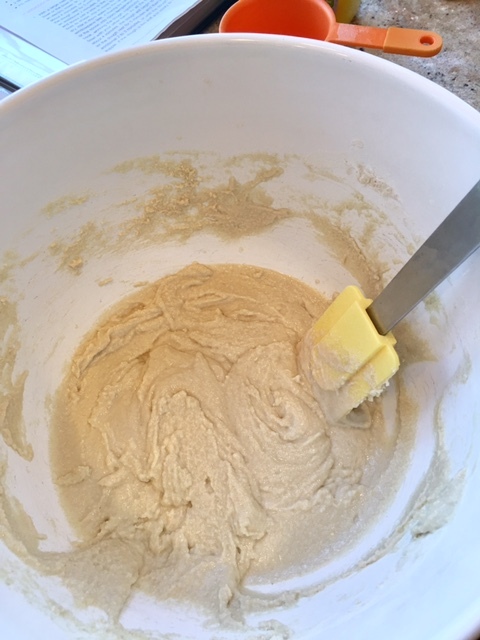 recipe about not mixing the dough by hand. That seemed silly and it mixed just fine by hand using a large spoon. The "dough" is really more of a batter at this stage - a wet, sticky mess that in almost no way resembles pizza dough. But just keep on keeping on, it all turns out just fine in the end. Next came another of the recipe departures. I didn't let the dough sit as instructed. 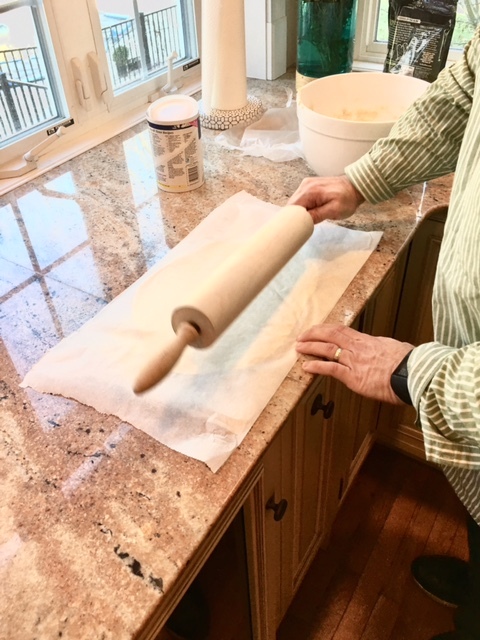 Instead, Colette came up with the great idea to treat the dough at this stage like she does cookie dough, spooning it out and rolling it flat between two pieces of parchment paper. What a great suggestion and I learned something new to add to my cooking repertoire! 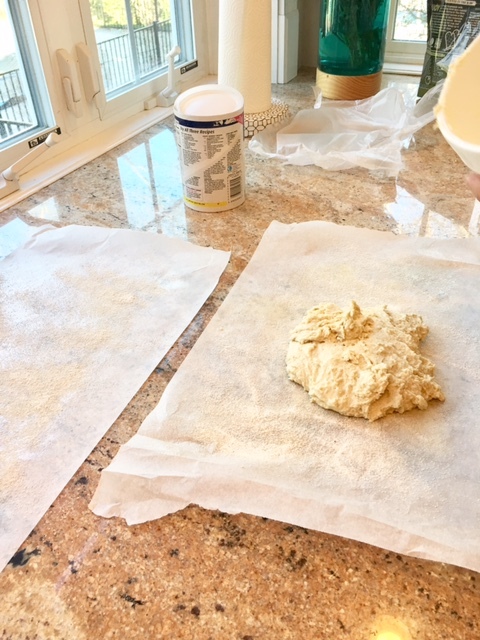 Next I spooned the dough/batter onto the middle of the parchment paper and then laid another large piece of parchment paper on top (also sprayed with Pam and sprinkled with corn meal). So at this point I had a dough and parchment paper sandwich. 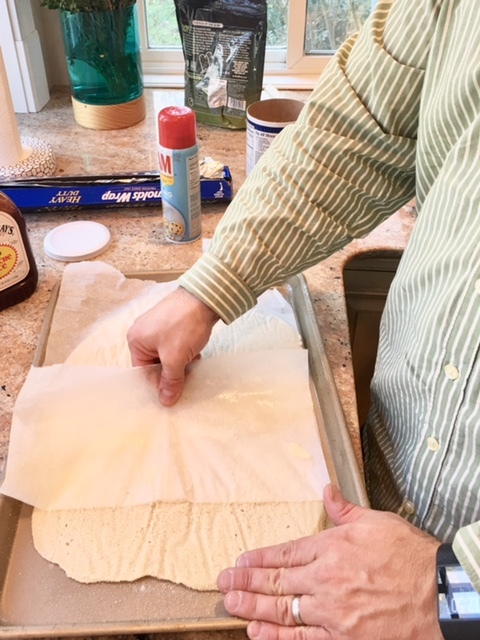 Then I took a rolling pin and flattened the dough out, rolling over the top of the parchment paper. This is the step where you get to decide how thick you want your dough. So roll it out as thick or thin as you like! Next we stuck it in the freezer for about 30 minutes. This step is key, because freezing the dough a bit takes it from a sticky unworkable state and turns it into something more resembling pizza dough that you can actually work with. 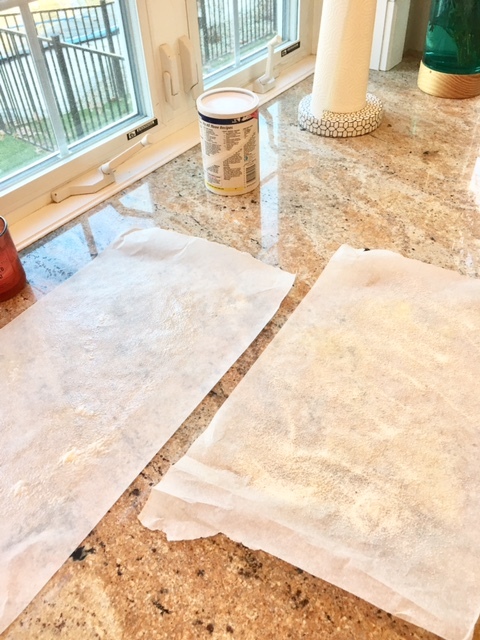 After you take the dough out of the freezer you peel away the parchment paper and lay the dough down in a greased baking sheet. One lesson learned here. 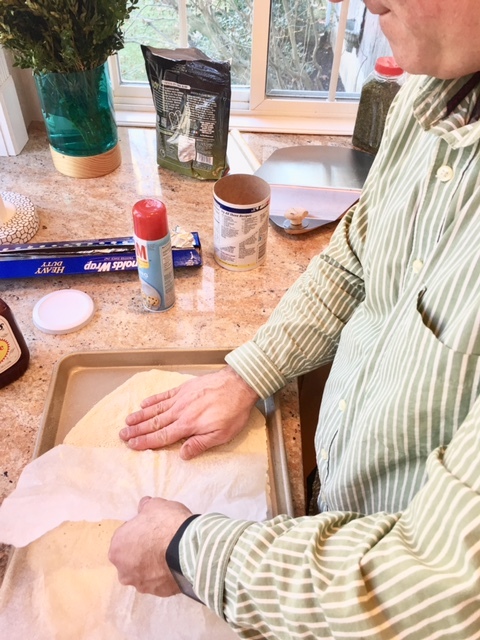 I should have left the dough in the freezer a little bit longer than I did, because when we peeled away the parchment paper it peeled easily off the edges but the middle of the dough was still fairly sticky and tore apart a bit. Freezing it longer would have left the middle easier to work with. The length of time you have to freeze probably also has a lot to do with how thick or thin you roll out your dough. Stick the baking sheet in the oven at 425 degrees for about 10 minutes or so to firm it up and get it ready for assembling and baking. One other lesson learned - the next time I make this pizza I'll roll out the dough thinner and try to get it to turn out almost like a crunchy, "crackery" crust (which is what Colette really loves). I think the amount of dough you get from this recipe is good for 2 medium sized pizzas, with thin crust, or one with regular crust thickness. 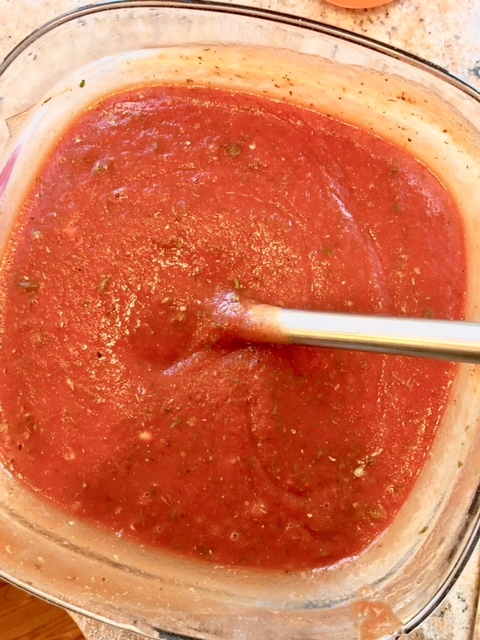 **Note: I usually don't measure the ingredients when making the sauce, so the above measurements are approximate. 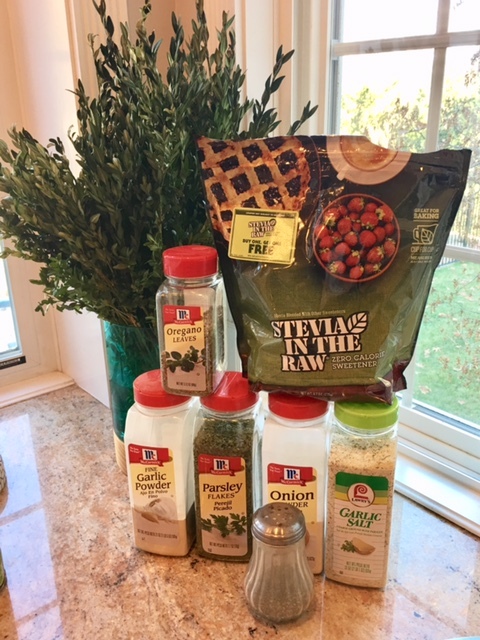 Mix all this together in a bowl. Taste, and adjust as needed to suit your taste. Note: this is fairly large amount of sauce. If you're only making a few pizzas, you can halve this recipe. 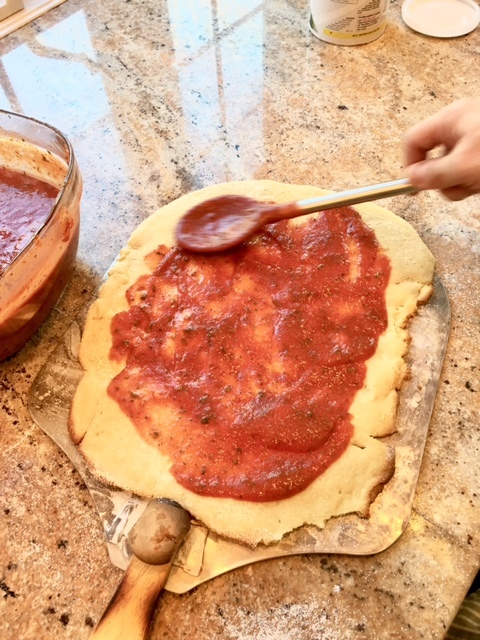 The last step is to spread corn meal onto your pizza peel, then lay the dough down onto the peel and build the pizza: sauce, cheese, then toppings. 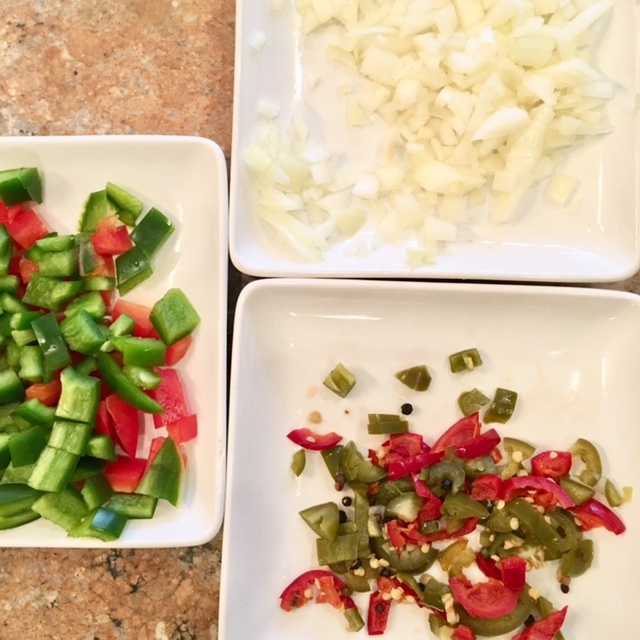 Here we topped with green and red peppers, onions, and jalapeno peppers. Slide the pizza into the pizza oven at about 700 degrees, and it should cook in about 10 or so minutes, depending on how crispy you want it to be. Make sure you rotate the pizza (using the peel) inside the oven a couple times while it cooks so it cooks evenly. In the spring we'll add some nice hooks for pool towels, and maybe something else summery/beachy, to the center piece. Next I removed the windows and window frame. Same thing--hammer and nail puller. Then I ripped the vinyl siding off the front (but left the siding on the three other sides--no need to change anything with them, except to paint the siding to match the color). I framed in the holes where the door and windows used to be, using 2 x 4 studs from Home Depot which I cut to size and installed with nails and wood screws. I then installed plywood over the holes where the door and windows used to be. Below you can see the window hole covered and the door hole framed in and ready to be covered. What it looked like after door and siding removed, holes framed, and plywood installed over window hole. Old door, door frame, and windows. The siding - gonna be a big trash day coming up soon! Next I built, installed, and painted the center piece. I got some 2 x 2's and 1 x 4's from Home Depot, and built this simple frame using the 2 x 2's for the side rails and the 1 x 4's for the slats down the middle. 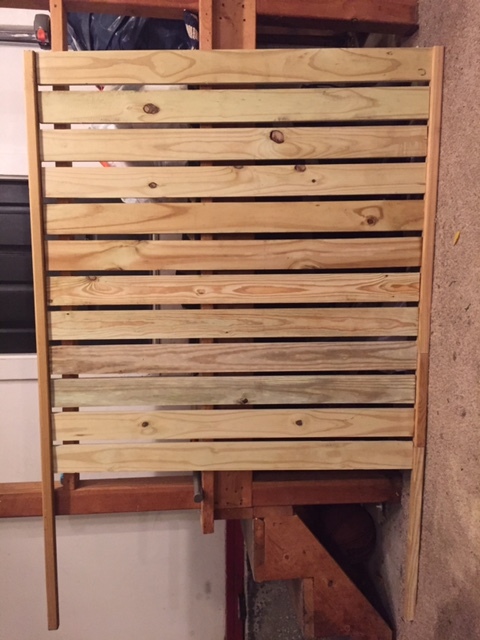 I just hammered this all together using large exterior finish nails, and used a small 1 x 4 block of wood as a guide to space the slats evenly all the way down. I then painted the plywood behind the shutters before installing anything else. The awesome shade of gray we used (also selected by Colette!) is Ben Moore Coventry Gray. I used 1 x 2's to build the inner frame which forms the border around the shutter slats. I just cut and hammered 4 pieces of 1 x 2 together to make the frame, and then installed it on top of the 28" outer border piece of 2 x 4 seen above. I then cut and installed a 28" piece of 2 x 6 as the top/outer border piece of the frame, and then finished painting the rest of the gray all around the center piece. Here's what the inner frame looks like installed, with the top and bottom outer frame pieces also shown. To make all the shutter slats, I cut a bunch of 1/4" lattice trim from Home Depot to size (26.5" long). I hammered 2 small brads into each end of the shutter slats, leaving the ends of the brads protruding roughly 1/4" or so. Important note--Before I installed the inner frame onto the plywood as shown above, I measured and cut (using a mitre hand saw) shallow diagonal slits 1" apart all the way down the interior sides of the 2 long pieces of the inner shutter frame, as shown below. With these diagonal slits cut and the inner frame installed, I then pushed each of the shutter slats firmly into place by inserting and pushing the brads on either side of the slats into the diagonal slits, as you can also see here. Next I cut and installed a couple 2 x 3 studs to form the shutter's 2 outer frame sides. I then squeezed a bead of liquid nails on either side of the tops of the slats and smoothed it out using my finger. Then used a small dab of wood filler to cover up the front edge of each of the slits cut into the sides of the shutter frame. After the liquid nails and wood filler dried I sanded it down and then used wood filler and caulk wherever else they were needed across the "new" front of the shed. I then installed some thin strips of wood trim across the top and sides of the shed wall to give a more finished look. Finally, I sanded and painted everything else that needed it.